Roses are red, violets are blue, I'm drinking wine tonight what about you? Heading to a restaurant, don't be shy, try something new, take a walk on the wild side. Charbono, Trebbiano, Argaman or Poulsard? These varietals may not be your everyday pick, but if you don't try them you might miss a trick. Should home be your venue when Cupid strikes, perhaps you need go no further than to the cellar to find what you like. 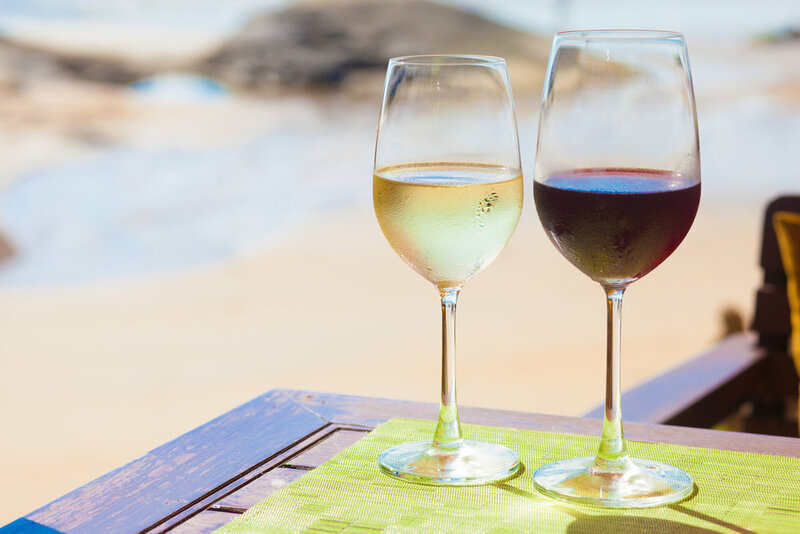 When humidity is perfect and temperatures are steady, give the wines the time they deserve and they will be extra special when drinking is ready. A special occasion means time for a wine review, 2001 or 1982? What happened then to the wine or to you? A stop to the wine merchant may be your best bet. May they be thoughtful and interested in all that you do or don't know. A new producer or region will always help your wine knowledge grow. On this Valentine's Day may a wine that you love, kiss your glass, warm your heart and connect you to Cupid's dart. Many of you will have experienced the American treasure that is California wine country. I have grown to love and appreciate the people, the places and the wines after moving back to the U.S. thanks to generous clients and new found friends. Literally the week before the fires I had a rare day out spending one on one time with my father. I was in San Francisco where my parents were on holiday and my dad agreed to drive me to my lunch in Sonoma. My lunch with Jean Arnold Sessions (a wine legend) in the garden of the El Dorado Hotel was on a beautiful autumn day. We discussed all things great and good about wine and I shared my new wine love with her, cool climate Viognier. Jean suggested we try the Bottle Barn in Santa Rosa to find some more examples and to see the full range of wines Sonoma has to offer. The drive is beautiful from Sonoma to Santa Rosa on the incredible Route 12 which leads to Bennett Valley Road. The road is as windy and challenging as any in the world and the geography is stunning, absolutely beautiful and rivals any of the top wine regions, drives like these are precious. I remember thinking, right now nothing else matters than this moment, set all of life's worries aside and take it all in, only in wine country do you get days like these. As we passed through Glen Ellen to make the left onto Arnold Drive I commented on passing through the historical town and how important it is to this history of California wine. Winding our way through the backroads of Santa Rosa we finally crossed Route 101 and found the Bottle Barn. Upon entering this incredible wine den I was like a kid in a candy store, so much to see and learn about. Just as I thought the day could not get any better, another amazing wine experience happened when Jeff Cohn, winemaker and Rhone wine collaborator started chatting with me over the white Rhone varietal section about the beauty and merits of Viognier. He was thoughtful, insightful and is passionate about his projects and his wines. For me it was another top day in wine country that ended with education and kindness, and a bottle of wine. The Napa Valley Community Foundation: click here. Center for Volunteer and Nonprofit Leadership: click here. American Red Cross Wildfire Relief Fund: click here. Napa Humane Society: click here. Community Foundation of Sonoma: click here. Redwood Empire Food Bank: click here. SHARE Emergency Housing: click here. Sonoma County Animal Services: click here. Redwood Credit Union Community Fund: click here. You Caring – Tubbs Fire Victims: click here. Rebuild North Bay: click here. Chile is one of the world's most exciting wine regions. Uniquely shaped with wine terroir that varies from West to East, Chile benefits from the cool Humbolt currents off the Pacific Ocean on the West and the varied altitudes of the Andes Mountains on the East creating unique microclimates and variation from North to South. As the only major wine producing country untouched by the nasty phylloxera mite that nearly wiped out wine production in Europe in the 19th Century, Chile can claim to have the most indigenous and pure rootstock in the world. As a result of the bio-climate the vines and the resulting wines can be called distinctly Chilean. We recently tasted through 14 producers and there were certainly some pronounced themes. Of the 14 producers 9 had a Sauvignon Blanc, most of which were unique depending on their proximity to the water. Global demand for “SauvBlanc” is certainly driving production and their unique Chilean expression is offered at a compelling price point. My favorite wines from the tasting were from a small, natural wine Massachusetts distributor, Indie Wineries. I had the pleasure of drinking the varietal Pais produced from 200 year old vines. I had to ask twice to make sure I heard him right. The wines were complex, clean full of life and fresh red and black fruits. There was something for everyone at the tasting and no two wines were alike. Piepno 2016, 100% Pais from Bio Bio in a liter bottle. Cot 2015, 33% Malbec, 33% Pais, 33% Cabernet Sauvignon. I would also try the wines from El Viejo Almacen de Sauzal, they too make a 100% Pais as well as a 100% Garnacha, all bio dynamic. Chile can offer exceptional value, but also exceptional diversity of place making the indigenous varietals sing on their own. All should not be painted with one country brush. Other varietals to look for are Carmenere and Cabernet Franc. Did you know Pedro Ximenez, the basis for sticky, toffee, gorgeous fortified wines, also expresses itself as an interesting still wine. We tasted a Pedro Ximenez by Mayu from vines at 600 feet above sea level that was clean, balanced and clearly from a cooler climate given the relative acidity and zing in mouth. Don’t shy away from the still wines that serve as the basis for sweeter wines, they can be a wine adventure in and of themselves. James Suckling: "The time for Chilean wine is now"